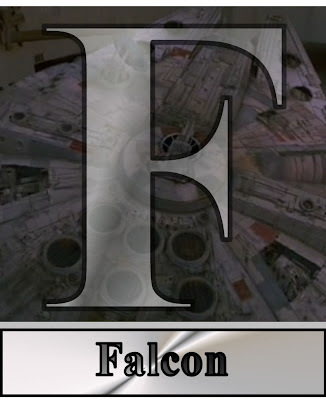 In this installment of Star Wars ABC's: the letter "F."
F is for Falcon. As in the Millennium Falcon. With that exchange, you learned everything you needed to know about the Millennium Falcon. Fast and maneuverable, but not necessarily sleek. Able to spin around and avoid annoying blasts from pursuing TIE Fighters. Capable of getting through an asteroid field despite the odds (3,720 to 1--I know, I know, "Never tell me the odds!). The Falcon is like your first car. It's ugly, clunky, but comes through in the clutch*. You keep it ugly because making it pretty wouldn't suit it. The ship has a long history (there's actually a book about this), but we all know it's Han Solo's ship. Han with Chewie as the co-pilot. The Falcon basically destroyed not one, but TWO Death Stars, carried the heroes of Yavin away from the Death Star with Princess Leia on board, rescued Luke Skywalker from Cloud City, tracked down Han after he was frozen in carbonite, dumped a huge load of spice that greatly displeased Jabba the Hutt. It is the signature ship of the Star Wars universe. TOMORROW: The letter "G." It's big. It's evil.